I started to write “Morning Fun Time with the Four Jarretts, pt. 3: The Jarrett That Was,” using the same template as Taskmaster Jarrett and Therapist Jarrett, but the only thing that TJTW ever says is some form of “the old Jarrett would’ve done that better.” I’m sure that would be as boring to read as it would be to write. Moreover, the more I thought about the things that I could say that might deviate from the replies, the sadder I became. It’s bad enough to have the “old Jarrett is better” thought popping up in my head at every turn, I don’t need to give it full conscious thought. Such thoughts were making me sad, and as a generally happy person, I’m against being sad! Even now as I am dictating this, TJTW is back there saying, “the old Jarrett would’ve been able to type this blog lickety-splits.” One small consolation of having such a prominent set of personalities in my head is that they use funny words too. Now we have the question, what to blog about? I’ll just sort of throw things out there as they arise, like so much rising crust pizza (mmm, pizza)…Sorry for the delay, I stopped to go to Panera Bread for some coffee. I also got a bagel, which is delicious, I’ll be taking breaks for “bagel bites” (this blog entry is brought to you by Bagel Bites). 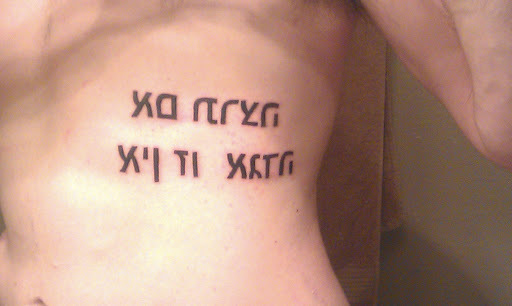 The lettering is Hebrew, it says “This tattoo really f’n hurt.” Not really, I don’t know that the f word exists in Hebrew; It says “If you will it, it is no dream,” uttered by Theodor Herzl. 2. The good doctor noticed my curling fingers during a previous visit, so she advised that she inject gobs of potent neurotoxin into it (she says to help with the hypertonicity, I think that she just wanted to stick me more). This means that I not only got injections of “sausage” (botulus = Latin for sausage, this translation is brought to you by Bagel Bites w/sausage) toxin in my leg, but I also got injections in my arm. I didn’t count the number of shots after the two in my foot (I was busy despairing about life without that foot, I was sure it was going to fall off). I approximate 15 shots. Another thing about getting TWO(!) shots in the foot, any shot after that (so long as it’s not in the foot) feels like your being tickled. Why do I do this? It’s not because I become so dexterous that I can play concert piano; to be honest, I don’t get much more function from these injections, but I do get quite a bit of relief (especially in my toes from the foot shots. Poetic, no?) You see, my toes constantly curl; it gets pretty painful. By deadening the toe flexors, my toes are much easier to relax. “Timesaver” #4: I need to finish this entry, so I can move on to other things. Ergo, my Timesaver will be to not do a Timesaver. In essence, this Timesaver is a paradox.